Glenn Beck and Fareed Zakaria are best known as political pundits, but this week the two are locked head-to-head in a battle over math. Beck launched the feud by claiming on his radio show last week that 10% of Muslims are terrorists. "What is the number of Islamic terrorists? 1 percent? I think it's closer to 10%, but the rest of the P.C. world will tell you, 'Oh no, it's miniscule,'" the Fox host said. Beck first made the claim in his 2003 book "The Real America," in which he said "Ninety percent of Islam is peaceful. Ten percent of Islam wants us dead." 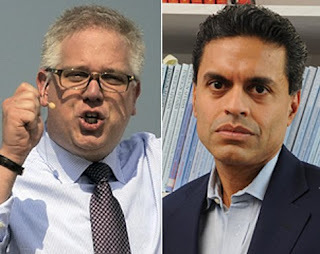 Fareed Zakaria, an Indian-born journalist and the former editor of Newsweek International, fired back at Beck's claims on his CNN show "GPS" on Sunday night. "Let's do a bit of math here," said Zakaria, demonstrating his calculations on a chalkboard. "There are 1,570,000,000 Muslims worldwide. Take ten percent of those Muslims and you get 157,000,000. That's how many Muslim terrorists Glenn Beck is suggesting there are in the world." He went on to attack Beck's math, and his methods. "Beck wondered why 'Oh why this wasn't receiving any media coverage?'" Zakaria continued. "Well let me suggest one reason. It is total nonsense. A figure made up by Glenn Beck with absolutely no basis in fact." Citing data from the U.S. State Department, which reported roughly 11,000 terror attacks worldwide in 2009, Zakaria multiplied that number by 100, on the "generous" assumption that each attack took 100 terrorists, even though most were committed solo or by small groups. Even using that exaggerated figure, Zakaria concluded, that would mean 1,100,000 people were involved in terrorist acts last year. "Glenn Beck's figure is 150,000 times higher than that," the CNN anchor concluded. "If in fact there are 157 million Muslim terrorists in the world, what were the other 155,900,000 of them doing last year?" Zakaria wasn't the only one to take issue with Beck's calculations, but the conservative pundit's camp didn't back down. Stu Burguiere, the executive producer and head writer for Glenn Beck's show, wrote a fiery blog post in answer to the "typical idiotic left-wing blogs" and the "not-so-typically-idiotic sources" going "nuts" over Beck's statement. "Dear Media: Glenn was right. You were wrong. Apologize," Burguiere wrote. He went on to defend Beck's calculations by pointing to a definition from dictionary.com, which defines a terrorist as "a person, usually a member of a group, who uses or advocates terrorism." Burguiere backed up his defense by including polls by World Public Opinion, which surveyed people in Muslim nations such as Egypt, Indonesia, Pakistan, Morocco and Turkey on their attitudes toward Al Qaeda and attacks on civilians in the U.S. One poll, for example, found the number of people who "approve" of attacks on U.S. civilians ranged from 24% (in the Palestinian territories) to 4% (Azerbaijan). Using these polls, Burguiere argued that everyone surveyed who expressed a negative attitude toward the United States would fall under the label of "terrorist," even if they had not personally been involved in terror attacks. Burguiere also took specific aim at Zakaria in a post on Sunday night titled "Fareed's GPS fails him spectacularly." "Fareed. Awful job," he wrote. "Perhaps, when trying to claim that someone else is incorrect, you should at least briefly familiarize yourself with their argument. In this case, the statistical backup from the respected polling agency that clearly proves what they said was accurate." But Zakaria may have gotten the last word, by using Beck's definition against him. In closing his argument against Beck, he cited another point the Fox host made about the .5% of the country (1.5 million Americans) who want to overthrow the government. "Does fomenting or supporting such anger against the American government make one a terrorist?" Zakaria asked. "Well, according to Glenn Beck's producer and his dictionary.com definition, maybe. But in that case how would one describe a man who has been fueling such anger against the American government on television daily for the last two years?" he said. "How, in other words, would one describe Glenn Beck?"